JERUSALEM -- The Israeli military says it has revoked all permits for Palestinians to visit Israel and travel abroad during the Muslim holy month of Ramadan, after two Palestinian gunmen killed four Israelis and wounded at least five others in Tel Aviv. The two attackers were detained, authorities said. COGAT, an Israeli defense body, said Thursday that all 83,000 permits have been frozen for Palestinians in the West Bank and Gaza to visit family in Israel, attend Ramadan prayers in Jerusalem or travel abroad via Israel's Tel Aviv airport. The travel permits are customarily given out by Israel as a goodwill gesture so Palestinians can visit holy sites and family in Israel during Ramadan. In addition, the military says it has frozen Israeli work permits for 204 of the attackers' relatives, and is preventing Palestinians from leaving and entering the West Bank village of Yatta, the attackers' home. COGAT says entering or leaving will only be permitted for humanitarian and medical cases. CBS Radio News correspondent Robert Berger says Palestinians have derided the measures taken by Israel as collective punishment. The gunmen opened fire Wednesday near a popular open-air market in central Tel Aviv. It was one of the deadliest attacks in an eight-month wave of violence. 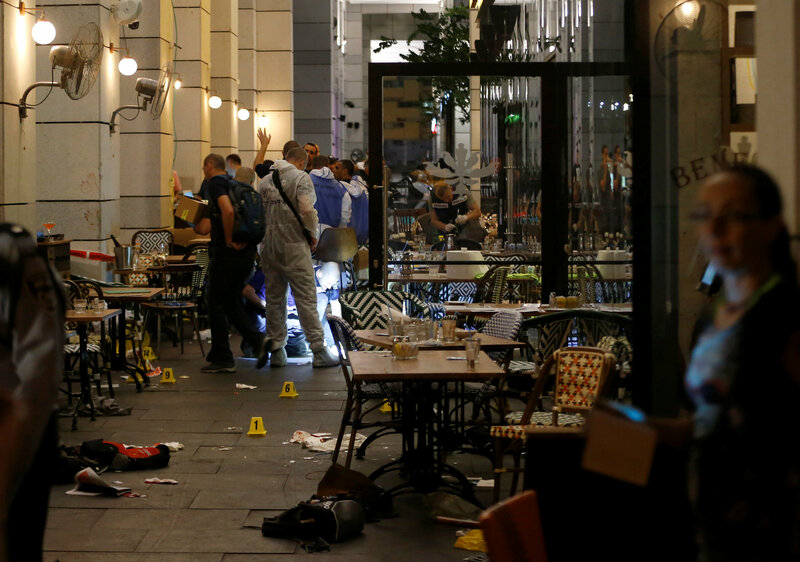 The shooting occurred at the Sarona market, a series of restored buildings that have been transformed into a popular tourist spot filled with crowded shops and restaurants. The complex is across the street from Israel's military headquarters and is often filled with tourists and young soldiers in uniform. CBS News correspondent Jonathan Vigliotti reports surveillance cameras from inside a packed restaurant show people scrambling as the gunmen calmly and systematically take down their targets, at one point an attacker is seen pistol whipping a victim. "I heard Allahu Akbar, Allahu Akbar, like two times and then five seconds later when I was looking around, I start hearing shooting, like seven shots, bam, bam, bam, and then I leave everything and start running out," described one witness to the carnage. Police were quick to respond, shooting down one of the gunmen at the scene. A few blocks away the second shooter was captured. The attackers were identified as Palestinian cousins from Yatta. "Two terrorists opened fire at civilians," Tel Aviv district police commander Moshe Edri said, adding that one of the detained attackers was being treated for a gunfire wound. A U.S. law enforcement source told CBS News senior investigative producer Pat Milton the suspects were said to have been dressed as ultra-Orthodox Jews, with traditional long black coats and black top hats. Police had initially said there might be a third attacker but later ruled that out after extensive searches and examining security camera footage. No Americans were injured or killed in the attack, a State Department source told CBS News. Police spokesman Micky Rosenfeld told CBSN authorities didn't receive any specific warnings about the attack. Tel Aviv's Ichilov Hospital said the four slain Israelis had been brought to the facility in critical condition and later died of their wounds. Prime Minister Benjamin Netanyahu met with his defense minister and security leaders shortly after the attack, then traveled to the scene. He called the attack a "cold blooded murder by despicable terrorists," according to a statement from his office. "We're going to take the necessary steps to attack the attackers, and defend those who need to be defended," Netanyahu vowed at the scene. Hamas, the Islamic militant group that rules Gaza, welcomed the attack but did not claim responsibility for it. Hamas official Mushir al-Masri called the shootings a "heroic operation" and the group later issued an official statement promising the "Zionists" more "surprises" during Ramadan. Channel 10 aired CCTV footage from inside a restaurant showing two men in suits shooting at diners as they run away from their tables. One of the attackers shoots a man on the ground and waves a knife before running out. Shlomi Hajaj, director of the market, told the station that security guards at the entrance prevented the attackers from entering, "averting a bigger disaster" as the market was packed with people. Yatta, the alleged attackers home village, is near the West Bank town of Hebron, which has been a flashpoint for violence in recent months. Most of the attacks have been in east Jerusalem or the West Bank, territories Israel seized from Jordan in the 1967 war which the Palestinians want for their future state. But Tel Aviv, Israel's most cosmopolitan city, has not been spared. A member of Israel's Arab minority went on a shooting rampage on New Year's Day, killing three people. And in March a Palestinian went on stabbing spree, killing an American and wounding 7 other people before he was shot and killed. U.S. State Department spokesman Mark Toner condemned the "horrific terrorist attack" in a statement, saying "cowardly attacks against innocent civilians can never be justified." U.N. Secretary-General Ban Ki-moon said in a statement he was shocked that Hamas leaders "chose to welcome this attack." CBS Radio News' Berger reports that, fearing more attacks, security was beefed up Thursday in Tel Aviv, with extra police in public places like bus and train stations.